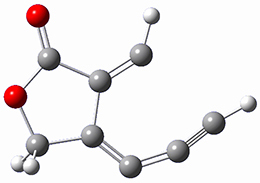 The multiconfigurational self-consistent field (MCSCF), especially complete active space SCF (CASSCF) method remains the only systematically improveable option for a host of molecules and processes with strong non-dynamical correlation. However, the requirement of a full configuration interaction (FCI) calculation for the active space results in a computational cost that scales exponentially with the size of the active space. There are therefore many interesting problems that remain out of reach for CASSCF. But perhaps not for long. This papers shows that the FCI steps of the CASSCF calculation can be replaced by FCI quantum Monte Carlo (FCIQMC) calculations, which scales significantly better than FCI. In the FCIQMC approach new determinants ($j$) are generated from old determinants ($i$) stochastically and included if the probability of this generation step exceeds a randomly chosen number between 0 and 1. The authors show that ca 25,000 sampling iterations yield energies within 0.1 milli-Hartrees of conventional CASSCF. As a result this approach could be used for a complete active space with 24 electrons in 24 orbitals with "only modest computational resources"! Here is another fine example of the power of combining experiment and computation. Xu and co-worker has applied the FT microwave technique, which has been used in conjunction with computation by the Alonso group (especially) as described in these posts, to the trimer of 2-fluoroethanol.1 They computed a number of trimer structures at MP2/6-311++G(2d,p) in an attempt to match up the computed spectroscopic constants with the experimental constants. The two lowest energy structures are shown in Figure 1. The second lowest energy structure has nice symmetry, but it does not match up well with the experimental spectra. However, the lowest energy structure is in very good agreement with the experiments. Table 1. MP2/6-311++G(2d,p) optimized structures and relative energies (kJ mol-1) of the two lowest energy structures of the trimer of 2-fluoroethanol. 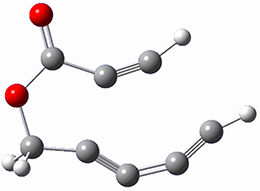 The added orange lines in the lowest energy structure denote the bifurcated hydrogen bonds identified by QTAIM. Of particular note is that topological electron density analysis (also known as quantum theoretical atoms in a molecule, QTAIM) of the wavefunction of the lowest energy structure of the trimer identifies two hydrogen bond bifurcations. The authors suggest that these additional interactions are responsible, in part, for the stability of this lowest energy structure. (1) Thomas, J.; Liu, X.; Jäger, W.; Xu, Y. 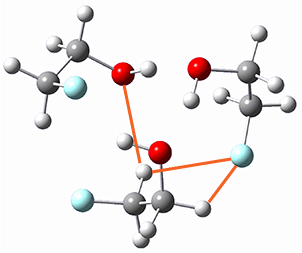 "Unusual H-Bond Topology and Bifurcated H-bonds in the 2-Fluoroethanol Trimer," Angew. Chem. Int. Ed. 2015, 54, 11711-11715, DOI: 10.1002/anie.201505934. First, the compare a wide variety of methods, ranging from semi-empirical, to DFT, and to composite procedures, with experimental gas-phase free energy of tautomerization. They use seven such examples, two of which are shown in Scheme 1. The best results from each computation category are AM1, with a mean absolute error (MAE) of 1.73 kcal mol-1, M06/6-31+G(d,p), with a MAE of 0.71 kcal mol-1, and G4, with a MAE of 0.95 kcal mol-1. All of the modern functionals do a fairly good job, with MAEs less than 1.3 kcal mol-1. As might be expected, the errors were appreciably larger for predicting the free energy of tautomerization, with a good spread of errors depending on the method for handling solvent (PCM, CPCM, SMD) and the choice of cavity radius. The best results were with the G4/PCM/UA0 procedure, though M06/6-31+G(d,p)/PCM and either UA0 or UFF performed quite well, at considerably less computational expense. (1) McCann, B. W.; McFarland, S.; Acevedo, O. 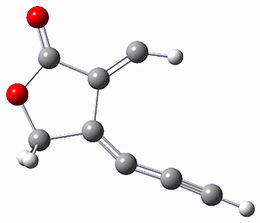 "Benchmarking Continuum Solvent Models for Keto–Enol Tautomerizations," J. Phys. Chem. 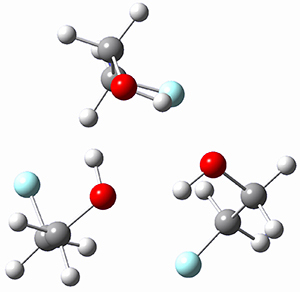 A 2015, 119, 8724-8733, DOI: 10.1021/acs.jpca.5b04116. 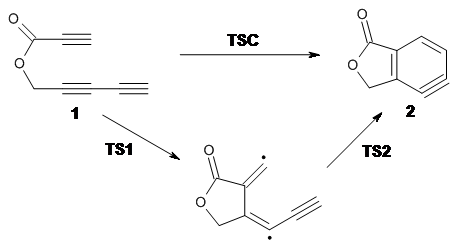 Cramer, Hoye, Kuwata and coworkers have examined the intramolecular cyclization of an alkyne with a diyne.1 Their model system is 1, which can cyclize through a concerted transition state TSC togive the benzyne product 2, or it can proceed through a stepwise pathway, first going through TS1 to form the intermediate INT¸ before traversing through a second transition state TS2 and on to product 2. Using both computations and experiments, they examined a series of compounds with differing substituents at the ends of the two yne moieties. The experiments show almost the exact same rate of reaction regardless of the terminal substituents. This includes the parent case where the terminal substituents are hydrogens and also the case where the terminal substituents (which end up on adjacent centers on the benzyne ring) are bulky TMS groups. And though there is no real rate effect due to changes in solvent or the presence of light or triplet oxygen, which suggest a concerted reaction, these substituent effects argue for a step wise reaction. SMD(o-dichlorobenzene)/B3LYP-D3BJ/6-311+G-(d,p)//M06-2X/6-311+G(d,p) computations help explain these observations. 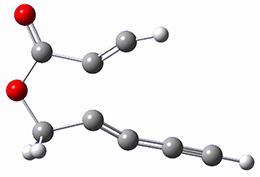 Shown in Figure 1 are the optimized geometries and relative energies of the critical points on the reaction surface for the conversion of 1 into 2, and these results are similar with the other substituents as well. Figure 1. SMD(o-dichlorobenzene)/B3LYP-D3BJ/6-311+G-(d,p)//M06-2X/6-311+G(d,p) optimized geometries and relative energies (kcal mol-1). The first thing to note is that the concerted TSC is higher in energy than the stepwise TS1. The wavefunction for TSC unstable towards moving from a restricted to unrestricted formalism. Reoptimization of some of these concerted TSs actually led to the stepwise TS. The next item of note is that TS2 for this case is actually lower in energy than the intermediate (this is a true TS on the energy surface, but when zero-point energy and other thermal corrections are included, it becomes lower in energy than INT). For some of the cases the second TS lies above the intermediate, but typically by a small amount. Therefore, the mechanism of this reaction is stepwise, but the second step might have such a small barrier (or even no barrier) that one might consider this to be concerted, though highly asymmetric and really bearing little resemblance to more traditional concerted pericyclic reactions. The authors obliquely hinted at some potential interesting dynamics. I suspect that molecular dynamics calculations will show no effect of that second TS, and one might observe some interesting dynamics, which could be seen in kinetic isotope experiments. (1) Marell, D. J.; Furan, L. R.; Woods, B. P.; Lei, X.; Bendelsmith, A. J.; Cramer, C. J.; Hoye, T. R.; Kuwata, K. T. "Mechanism of the Intramolecular Hexadehydro-Diels–Alder Reaction," J. Org. Chem. 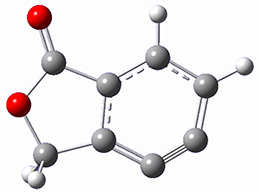 2015 ASAP, DOI:10.1021/acs.joc.5b01356. The great strength of density functional theory (DFT) in its purest form is that the energy only depends on the charge density, whether its magnitude alone (LDA), or with its gradient (GGA) or beyond. This simplicity is, of course, also the source of some of its largest errors: poor band gap predictions, excessive delocalisation of charge density, poor description of charge transfer, and problems with band widths. Many of these issues can be solved by the addition of a judicious amount of exact exchange, giving hybrid functionals. But exchange is very expensive to calculate, and requires the use of orbitals in the place of a charge density. And there is the associated question of what fraction of exchange to mix (there are many hybrid functionals available, each with a different fraction of exchange) and even whether the exchange interactions should be screened (and if so, by how much…). An interesting recent review and extended opinion piece from one of the key practitioners in the field gives more details on some of these problems, and is well worth a read. A similar attempt has been made to create consistent potential and energy functionals which also reproduce key features of the exact exchange[4,5]. One of these, the derivative discontinuity (DD), describes a change in the gradient of the energy with respect to electron number at integer fillings; this behaviour is missing from most semi-local functionals. The AK13 functional restores this by considering the asymptotic behaviour of the functional, giving reasonable accuracy for band gaps, without the need for fitting (the mBJ functional has parameters that are fit to improve the accuracy). A very recent paper, which presents a comparison of results and potentials from these functionals, shows, as ever, that there is no single functional that gives good results in all situations (though in principle the exact density functional should do this). As DFT practitioners we must choose whether we want to use highly fitted functionals which give excellent accuracy within certain limits, or to use functionals which respect certain important limits and behaviours for the electron gas. There is no universal function, just as there is no universal basis set, and part of the practice of DFT simulations is to quantify carefully the limitations and effects of the approaches we choose.